Doctor Who: Revisiting THE TRIAL OF A TIME LORD | Warped Factor - Words in the Key of Geek. Tony Fyler is on trial for his life. In retrospect, the Trial of a Time Lord season makes a kind of sense – but only if you look at it from another dimension. In another dimension, where Doctor Who was still taken off the air for its hiatus, it roared back, addressing its critics directly, putting the Doctor on trial to combat all the criticisms of the show that were levelled against it. 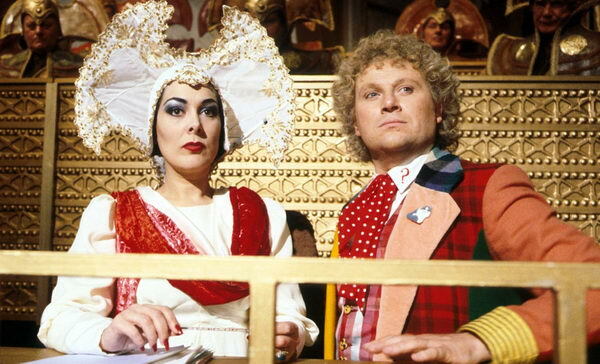 It took them on, demonstrated their folly, and the programme stormed back to its previous popularity, with Colin Baker’s Doctor vindicated and set to fulfill his hopes of becoming the longest-serving actor in the role. It was a gutsy move, and it depended on the Trial season knocking four home runs straight out of the park. Most of us would like to live in that dimension. Sadly we live here, where the scripts were for the most part reasonable, but where the constant bickering of the trial format interrupted most attempts to develop a strong storytelling flow, and where, not to put too fine a point on it, many of the best lines in the trial sequences were given to the in-universe voice of the show’s detractors, the Valeyard – played with a magnificent range of malice by Michael Jayston. We live in the universe where the Script Editor was hostile to the Doctor, both in character and actor, and where there were growing tensions between Script Editor Saward and Producer John Nathan-Turner. Where the final story’s script, penned by an increasingly ailing Robert Holmes, was pulled at spectacularly short notice, and replaced by a necessarily rushed job from husband and wife writing team Pip and Jane Baker. Where established companion Peri was written out in a horrifyingly adult way, and her replacement, Mel, was written in with no chance for a backstory and a three line character note. By adopting the trial structure in the first place – and jettisoning some scripts that had been in development in the process – the production team acknowledged a weakness in ‘business as usual’ that put them on the back foot from day one. 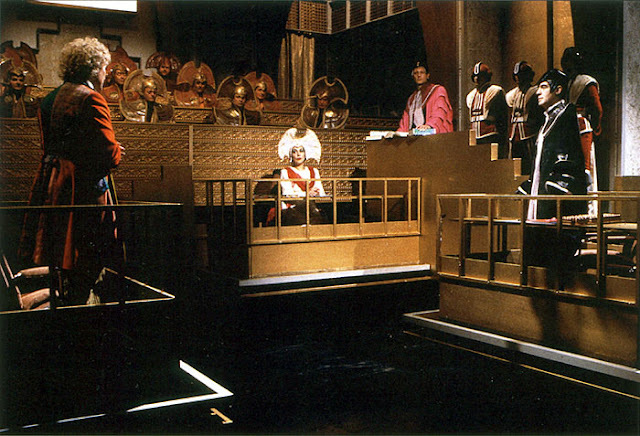 But let’s take a look at the Trial of a Time Lord objectively to see, thirty years on, how it stands up. The new version of the theme music was pretty much geared to disappoint: coming on the back of the tweaked Peter Howell version, which screamed and had a solid, almost heavy metal bassline, the version used for the Trial season felt wimpy by comparison, its bassline barely tapping along and the melody wandering in and out of fans’ expectations – and sadly, no new money was found to match a new title sequence to the music, meaning it looked out of sync and weak. But then Episode One of The Mysterious Planet opened with the effects shot of the space station, and fans’ hearts raced with hope – that was where the money’d gone; new models and effects, that looked better than pretty much anything that’d come before. But the hope quickly faded as the chatter between the Doctor and the figure in the dark went on, and on, and on. More Time Lords filed in, including Lynda Bellingham in a lightweight Time Lord headdress that looked like someone had bent a couple of coat hangers and stretched a pair of white tights over them. And the talking went on. And on. Then the Time Lords settle in to basically watch Doctor Who for a while. Even when they do, what we get is the Doctor and Peri yomping through a forest for a bit. Even the Doctor interrupts to call it ‘inconsequential silliness,’ breaking the flow. Once The Mysterious Planet gets going, it’s solid, above-average fare, because let’s face facts, Robert Holmes could write better Doctor who with one hand behind his back and a pint in the other than most eighties writers in a huddle. Glitz and Dibber are delicious, a kind of updated Garron and Unstoffe from The Ribos Operation, only a bit more dangerous and vaguely psychotic. The situation at ‘Marb Station’ is a satire on petty bureaucracy and doing things to the letter of the law, even if it means people die needlessly as a result. The L1 robot is actually quite an impressive-looking piece of kit, and Joan Simms, while clearly having very little idea what she’s doing, gives it her all as Queen Katryca, like Beryl Reid as Briggs before her. The story hangs together well, gives hints of remaining mystery and delivers solidly satisfying Holmesian Who, feeling like the veteran had smashed his Ribos Operation into his Sunmakers and produced something that felt familiar but oddly fresh. But oh, the trial sequences. They slowed everything down, disengaged the viewer from potential dramatic consequences and added little of any substance, leaving The Mysterious Planet feeling disjointed and lacking in peril. Mindwarp was a shoe-in, given the success of Vengeance on Varos – planet of Sil and the Mentors? Hell yeah. And bless it, there was a story in there somewhere too. But whereas Varos was lean, linear and ultimately straightforward in its social commentary, Mindwarp came across as being largely violent for the sake of violent, underlining another great criticism that had been levelled at the pre-Trial show. What’s more, the unreliable narrator testimony of the Matrix, albeit a necessary plot construct, added fuel to the fire of those who thought Who was unnecessarily violent, as the Doctor appeared to abandon his normal moral scruples, sacrificing Peri for his own ends. 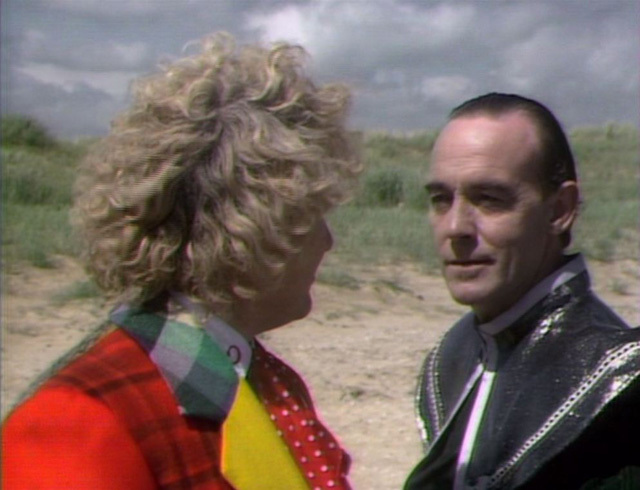 It was a message double underlined in red when Peri was written out, her body desecrated and her mind destroyed, arguably as the result of the Doctor’s neglect. Was this the programme people wanted saved? 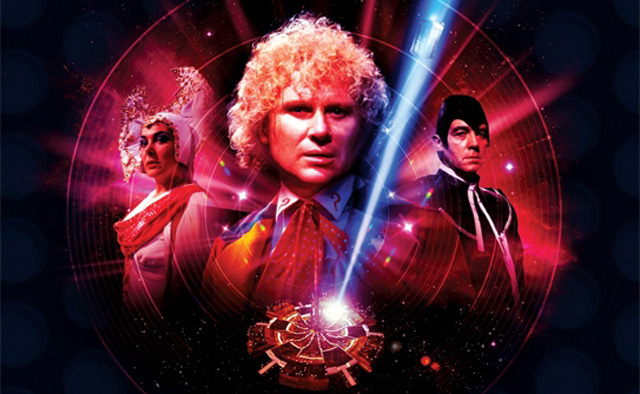 It was easy for BBC bosses to argue that it wasn’t, that it trivialized violence and that its lead character had lost his way in the Colin Baker era. Terror of the Vervoids had straightforward linear plotting up the ying-yang, and was significantly more accessible for it. Basically an Agatha Christie novel in space, with added talking Triffids, it was beautifully set and for the most part well-acted, with some strong character actors filling their boots in meaty roles – including of course Honor Blackman as Professor Lasky the somewhat blinkered agronomist. Where it lost points was in introducing Bonnie Langford’s Mel with nothing in the way of backstory, and so having her come across as the archetypal 70s ‘screaming girl companion’ of much parody, and in the Vervoid costumes themselves, which were about as archetypal ‘bloke in a silly costume’ as you could get. There’s a tradition in retrospective fandom that thinks of the story as Terror of the Vulvoids too, the masks being somewhat suggestively shaped and detailed, but it was more the obvious costume and the lack of explanation for anything they did – suddenly, without warning, they sprayed gas out of a hole in their face, which was never explained or referred to again, for instance – that made them ripe for criticism. And to close the season, there was the rapid-fire mess that was The Ultimate Foe. Yes, it gives some solid atmosphere, evoking The Deadly Assassin with its disturbing Matrix scenes (and again, laying the programme open to accusations of needless violence), and yes, the idea that the Valeyard was a dark, future Doctor was delicious, and pays dividends to this day, but the Master is there for no good reason but to narrate the plot and drop exposition-bombs, the ultimate plot is madness delivered through meaningless technobabble – “A megabyte modem!” – by all means, laugh your face off from the future. “A particle disseminator” – yyyyeah, OK – and the ending is rushed and massively too convenient. All charges dismissed, and as a bit of good news, Peri’s not really dead after all. She is married to Brian Blessed’s King Yrcanos though, so swings and roundabouts. Essentially, Trial of a Time Lord was a gutsy move to take on Doctor Who’s detractors, beat them down and move on stronger than ever. But in broken narrative threads in The Mysterious Planet, in needless, shocking violence and grimness in Mindwarp, in blokes in silly monster costumes and screaming girls in Terror of the Vervoids, and in hammy dialogue and meandering plotting in The Ultimate Foe, the Valeyards in the BBC had something in every story with which to accuse the show. The Trial season failed to make its case strongly enough for the show, and viewing figures were also hampered by having an overall series arc, meaning if you missed a part you had no clue where the trial was going to be when you picked it back up. BBC bosses capitalized on its failure, demanding a change in the lead. Ultimately, they were wrong about what was wrong with Doctor Who at the time, but it would take thirty years, and a company called Big Finish, to prove that conclusively.